We said "Au revoir " to the sisters of La Cordère. 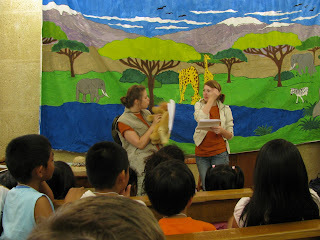 They came to our final VBS program and were delighted to see the work that we did for the children. Front door of La Cordère, the Catholic Retreat Center. Next door is La Chapelle du Rosaire. This chapel was built and painted by Henri Matisse for this order of Dominicain nuns. He was nursed back to health by one of them and the chapel was his way of saying thanks. He considered it his finest work. We were given a private tour and could walk through it at any time. The stain glass windows are green and blue and the interior is a modern white. This is the view I saw every day as I left my room at La Cordère. It is a catholic retreat center. Well, we had a little adventure two days ago. After arriving back from VBS, Ruthie, Christine, and I decided to go to Monoprix. We got into the elevator on the first floor( which is actually the third when you count the basement and 0 floor) and started it. You know how sometimes you are tempted to jump in the elevator? Well, we did, and it worked really well. Actually the elevator stopped with about half of it in the shaft and about half still in front of the first floor door. First we tried to get the elevator to start again, but that didn't work. Then we pushed the alarm button and tried to use the alarm phone, but to no avail. Then we opened the elevator door and were able to see a little through the cracks of the floor door. The guys' room was just outside the elevator so we started shouting. They came and tried to open the door from the outside, but couldn't so they called a nun. She wasn't happy at all, but had a tool which she was able to use to open the floor door. However, she wouldn't let us get out because if the insurance people saw that someone had tampered with the elevator, they would not be happy, so she called the service people and we waited for about fourty-five minutes. It was quite hot, and there was little air, but we were fine. Finally, the service man arrived and opened the door exactly the way the nun had and we climbed out, just in time for dinner! I'm really greatful to God that he kept us safe and that the elevator stopped near the door because I'm not sure what would have happened otherwise. Here we are standing firm on the Word of God. Yesterday we went for a walk in Vence, a medival village. Behind us is a cathedral with pillars that were put up in 239 AD. We also were able to see other old buildings and sights, such as a place where the villagers would go and wash their laundry together. Reagan is writing in her journal on the terrace of our house: la Cordiere. It is so important to keep track of our thoughts, feeling, reactions and impressions during this trip. We have seen God work in the lives of the children. We have seen many prayers answered. It has been an encouragement to our faith and we need to document it. We must keep journaling even after we get home because we will experience reverse culture shock. This is the crafts station.led by Reagan Cerisano. Each afternoon the children cycle through crafts, science, and music. 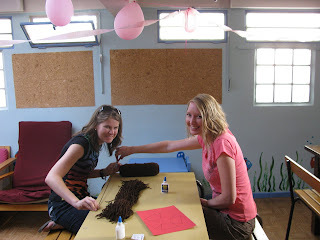 The children make a new craft every day, and take them all home at the end of the week. 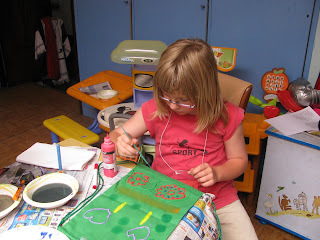 Here they are making prayer journals with decorative covers. With each group there has to be at least one bilingual helper to translate for the kids. 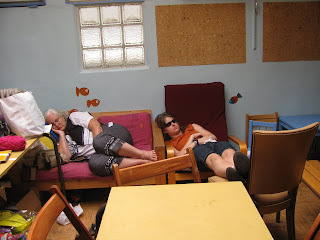 At the VBS in Saint Paul de Vence, the vast majority are English speakers as opposed to the previous week (in Marseille) where only a few understood English. 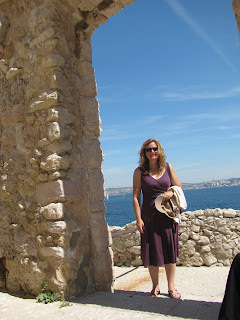 Our fearless leader, Maureen Orsini, at the portail of Chateau d' If. Maureen married a French man and lived here in France for many years. She found Christ in France and has a heart for the French people. 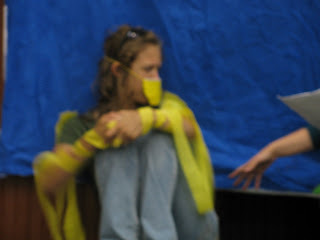 She and her family have been leading VBS groups for several years. On Saturday we went to visit Chateau d' If. 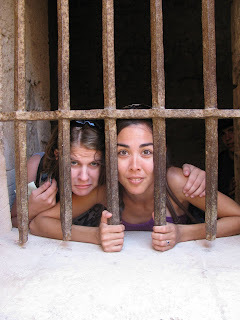 Voila Angelise and Reagan behind bars. In the final skit the kids found out that the Krakatoo, a rare bird (played by Claire Beer) had hurt her wing in Dr. Bakari's trap. Bakari asked for forgiveness for being selfish. Friday afternoon was the final program. The children showed their parents what they had learned. They sang the songs and did the motions. 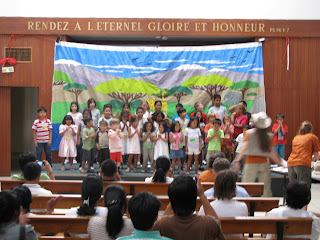 We presented each child with a French Bible and they recited the Lord's Prayer. 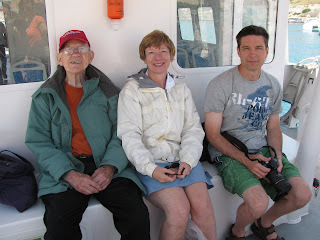 The parents were pleased and asked us if we were coming back next year! 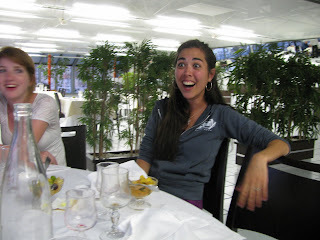 Language laugh for the week"
We are hot and sweaty all day, but we bathe and change for dinner at the Officer's Club. What a good looking group! This is an opportunity for teens to practice manners. In the French Culture the meal starts at 8 PM and finishes after 10 PM and the teens execute conversation in a polite manner. For sports each day, we walked 1 mile to a public park. There were lots of moniteurs and monitrices to hold the kids' hands. Once at the park, Jonathan Lamb had games prepared. We brought large balls, water pistols and slingshots for water balloons with us. The kids loved it. Since we are officially a kids' camp, we had to make sure that each child had a cap and water bottle. The first two days were unbearably hot, but then the weather cooled off and there was a breeze. The sun was always bright in the mediterranean sky. 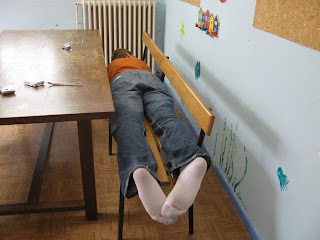 McNair during naptime. These students have made incredible progress in their French and knowledge of the culture. Katelyn on the table, Christine on the bench and Kaleb on the floor are fast asleep. They have worked very hard this week. Pray we finish strong. All the children bring a sac lunch and then we show the Jesus film after lunch. This gives our moniteurs and monitrices a break. Colleen and Reagan are napping. This adorable child with an angelic face and long blond hair is painting a bag to take home. The name? Vincent! It`s a boy. All the moniteurs and monitrices ( staff, counselors) were confused. Every time we said " elle" (=she), his friend corrected us to " il"(=he). 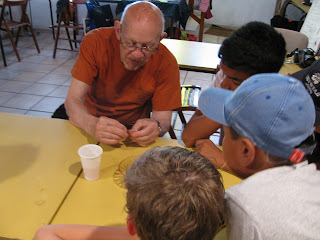 My dad, Dr. Lathrop, explains a concept in Science. All the experiments are simple, but they tell us something about God. We use the things that we can see to understand the things we can not see. 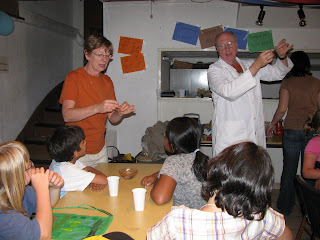 Dr.Beach explains about magnets in Science and I translate. The kids love the activities. Colonel Painter is our leader and the missionary with ICC. 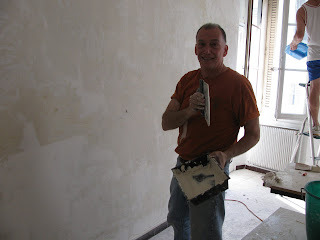 He and his wife Nancy do everything possible to encourage the small French churches. 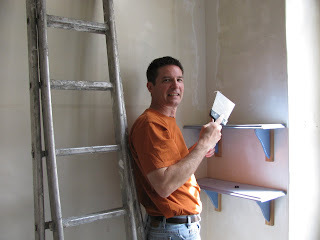 Bruce Bittenbender is applying stuff to the wall. The materials here are different than in the USA. 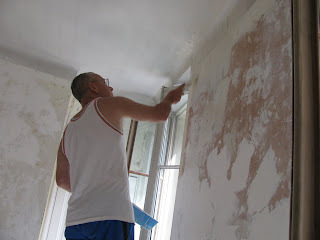 The men have had to be flexible and use a type of caulking that dries instantly. 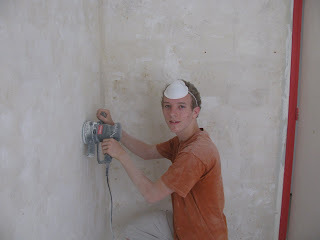 Kaleb Reilly has done hours of sanding to prepare the apartment. In addition to the VBS for the Reformed and Baptist churches, we are helping them with renovation. Both are housed in very old buildings. The Baptist church has been without a pastor for 2 years. It is the custom for the pastor to live in an apartment above the church. Brian Beer is getting the apartment ready. Here I am with the oldest group. We, the staff, wear orange t-shirts. 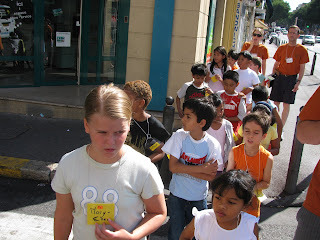 This helps to identifiy us to the kids and it helps as we cross the busy streets of Marseille. The people of the neighborhood are happy to see the children and usually make way for us as we walk between the 2 churches. After the skit at the Reformed church, we walk with the children to the Baptist church 2 blocks away for the Bible lesson. There are 3 age groups: les singes ( the monkeys- ages 2-6), les lions ( the lions - ages 7-9) and les zèbres ( the zebras - ages 10 - 13). Katelyn and Kyle translate for the youngest group. Stephen, Daniel and Kaleb have taken turns with the middle group and McNair helps me with the oldest group. Every morning starts with a skit. Here Katie Beer and Christine Orsini do their roles in front of the gorgeous backdrop that the Stephens family painted for us. 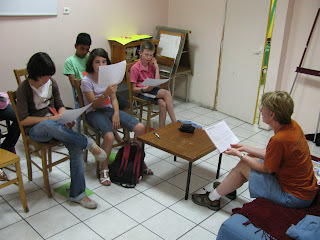 The children LOVE our teens, their drama and the comedy.